Attorney General Greg Abbott has a big bank account, a political organization and a nearly clear field on the path to governor — if the office is open in 2014. Greg Abbott has a shiny political résumé, an astonishing amount of money in the bank and has geared up for a statewide campaign with careful and deep planning on the ground and in the air. Here’s the sweet part: the mere existence of that political arsenal might be enough to ward off any rivals. It is possible he could become the next governor of Texas without any serious competition. The fly in the ointment is named Gov. Rick Perry. 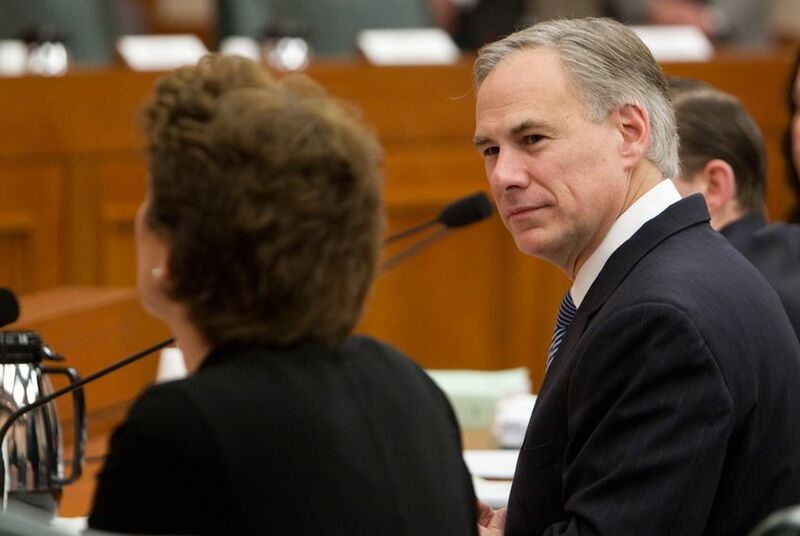 Should the governor choose to run again — a hot topic around the Capitol for the last few months — Abbott’s hope of a free shot could turn into a political donnybrook. Perry said on a marketing tour in the Northeast that he would announce his intentions by Monday, but since then he has called lawmakers back into another special session that is likely to delay his revelations. Those who love election battles pray for the spectacle: they want a Perry-Abbott bout at the top of the ticket. They might get a coronation instead. Republicans in Texas and elsewhere are historically orderly about these things. It is not unusual to wait in line for a climb up the career ladder. But with most political competition here confined to primaries instead of general elections — the result of Republican hegemony in statewide races and redistricting in congressional and legislative ones — the infighting has increased. Perry was challenged in 2006 by Carole Keeton Strayhorn, a Republican comptroller who ran that year as an independent. Four years later, it was United States Sen. Kay Bailey Hutchison who tried and failed, along with Debra Medina, a newcomer who lost that race but plans to run for comptroller on the Republican ticket next year. Then Ted Cruz showed up and elbowed his way to the front in a Republican Senate primary runoff, defeating the presumptive favorite, Lt. Gov. David Dewhurst. Along with the other lessons of that race was this: Texas Republicans seeking higher office do not have to wait for resignations or deaths to move up. It might not matter next year, with most statewide offices open. The lieutenant governor might be the only statewide official on the ballot seeking re-election, and the unraveling of the first special session last week left him in terrible political shape. One of the 31 senators under him — Dan Patrick, R-Houston — took advantage of the break between special sessions to announce he would run for lieutenant governor because, he said, “we need new leadership.” Two other state officials are also in the race. Incumbency usually wards off challengers, but Dewhurst’s problems have proved attractive to them. In a year that promises great turbulence in the government organization chart, only Abbott and Tom Pauken, the former workforce commissioner, have expressed interest on the Republican side in the governor’s job. Abbott has apparently scared everyone else away. He has been an aggressive attorney general, suing the federal government more than two dozen times and slapping the Obama administration with a steady stream of news releases and statements that reinforce his conservative bona fides with his red state supporters. He has kept himself out of the governor’s way, moving in parallel on almost all policy issues and avoiding situations that might make the two men appear to be rivals. Strayhorn and Hutchison were critical of Perry before their races, leaving some to wonder — especially in 2010 — whether he might have stepped aside if the other aspirants had given him some room. Abbott has given him that room. None of that explains why the attorney general is the presumptive favorite on the Republican side. It’s an expensive business, and Abbott has money. The Republicans spent more than $40 million in the 2010 primary. Since his first race for attorney general, in 2002, Abbott has not faced a strong opponent who could match his combination of organization and political treasure. After years of building his bank account, it totaled $18 million at the end of 2012, according to his latest campaign finance report. Another, due in a few weeks, is expected to be just as daunting to would-be opponents. He looks formidable. Only Pauken seems willing to challenge him in a primary, and Abbott’s only real obstacle is the governor, who has not shared his plans.